This item is PIR Auto Human Body Motion Induction Lamp. The lamp toggle switch has 3 positions(OFF,ON, and AUTO),you can turn on or turn off it by hand or let it automatic induction. 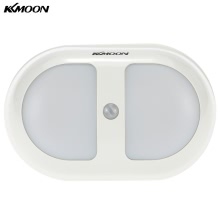 When set to AUTO, the lamp will light up automatically if human motion is detected a valid range and go off if no human motion is detected.It often used in bedroom,garage,corridor and so on. *The lamp toggle switch has 3 positions(OFF,ON, and AUTO),you can turn on or turn off it by hand or let it automatic induction. *Using advanced PIR sensing technology,when set to AUTO,it will automatically light up or light off when body enter or leave the sensing area. *Simple installation,can stick to anywhere you like. *Low power consumption and long operating life. *Environmental friendly light,energy saving, but enough bright. *Suitable to use in bedroom, corridor, workshop, basement, garage, garage entrances and other places.